What a blessing to celebrate Thanksgiving this week with family and friends. Though the year has passed quickly and has had many challenge-filled opportunities, in reflection, I am blessed. I hope that before the day is filled with all the “to do’s” on your list you, too, might find a moment to pause and count the good things in your life. I also acknowledge that there will be a void without my sister and many of you who have also lost a loved one, may we honor their life with the positive memories and continue their mission with our own. As we gather, I can almost smell the pies, the turkey, and all the trimmings. 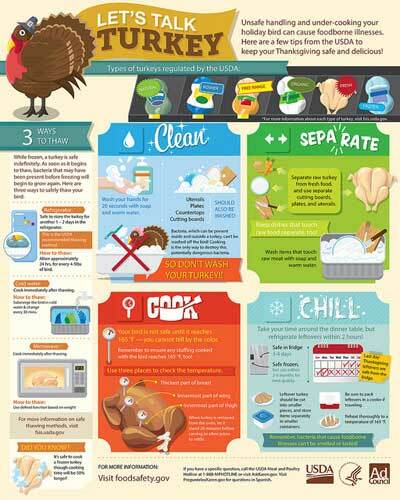 I would like to offer a website that provides a lot of information, http://www.foodsafety.gov/keep/types/turkey/index.html. Thaw all foods in the refrigerator, not on the counter. This requires planning your timetable ahead. To avoid the possibility of spreading salmonella, do not wash the turkey prior to roasting. Use a meat thermometer to ensure an internal temperature of 165 degrees – you can’t tell by the color. Let the turkey sit for 15-20 minutes to let the juices settle before carving. Remember that pumpkin pie is a custard and must be refrigerated to be safe. To stretch your food dollars, add vegetables to your menu. Not only are they good for us, they are lower in calories, provide color and variety and are less in price than meats or many desserts. While Turkey is usually the main meat, I’ve had several questions for ham this year. On the same site, http://www.foodsafety.gov/keep/charts/hamstoragechart.html is available for your use. If you don’t have access to the internet and would like for me to send you a copy of any information mentioned above, please give me a call at 330-264-8722. From all of us here at OSU Extension in Wayne County, Happy Thanksgiving to you and yours!